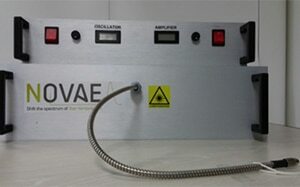 The Brevity Basic platform is a thulium doped fiber laser capable of generating 150fs pulses at 1950nm or 2070nm and a repetition rate of 20MHz with output power up to 200mW. The Brevity laser architecture is based on a robust oscillator/amplifier structure that delivers transform femtosecond limited pulsed and a high spatial mode beam quality. These cost-effective lasers are ideal for high speed spectroscopy, super continuum generation, optical nonlinear optics, etc.